SGM Gives URSU Members a Voice and Ten Bucks! 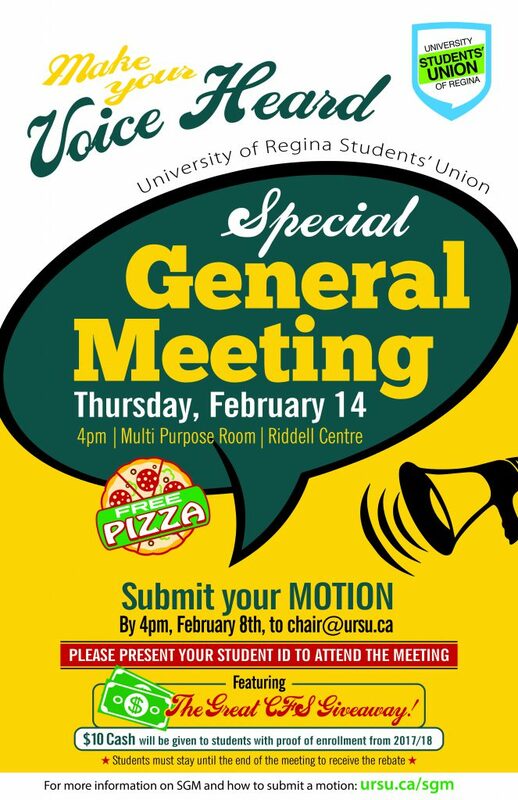 The 2019 URSU Special General Meeting is your opportunity as a member of the University of Regina Students’ Union to make recommendations on the administration and strategic direction of your Students’ Union! This is your chance to address issues you’ve seen on campus, in the community or throughout your time as a University of Regina student. An SGM is your best opportunity to have a say in the future of the URSU and the only time we will be giving you a little something extra. All URSU members are welcome and encouraged to attend the Special General Meeting in the Riddell Centre Multi Purpose Room on Thursday Feb. 14th at 4 pm. Those in attendance that were student members in the 2017/2018 school year are eligible to take part in the Great CFS Cash Giveaway! We’ll be refunding students the CFS fee charged to them between 2017 and 2018, which means you could get $10 just for coming to a meeting! Oh…. and free pizza!